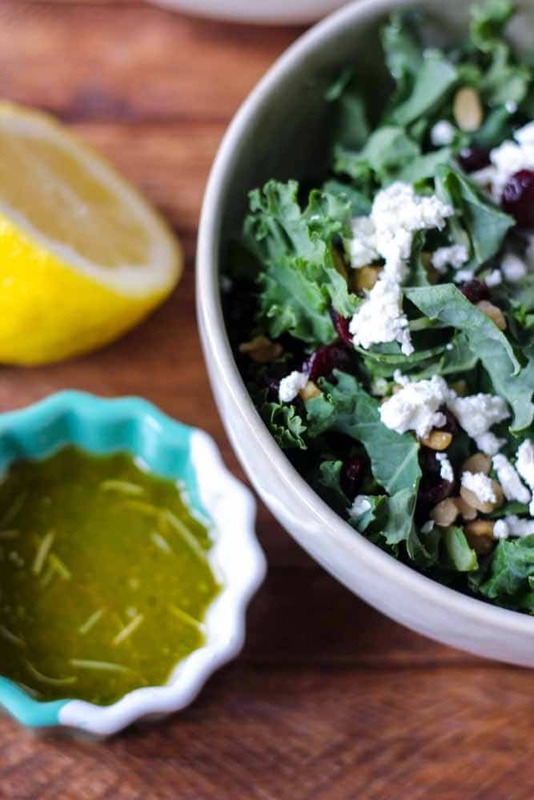 Chopped kale salad with goat cheese, dried cranberries, nuts a homemade salad dressing. It’s a light, creamy and crunchy salad recipe made for summer! When the sun is beating down I’m never really hungry and always opt for a light salad. Especially if I’m at the pool or doing an activity that requires wearing a swim suit. But I don’t like bland, uninteresting salads that I just eat because I feel like I need to eat a salad. I like flavorful, vibrant salads I get excited about eating and actually crave. It doesn’t happen very often, but when I find one I love I end up eating it for dayysss. This kale salad is one of those salads. I especially like the way the kale is cut. I’m not a major fan of huge chunks of lettuce. Mostly because I’m notorious for spilling and the large chunks just increases the chance of it ending up in my lap or on my clothes. The thinly cut kale makes it easy to eat with a fork and the kale-to-topping ratio is so much better. More cheese, craisins and nuts > kale. 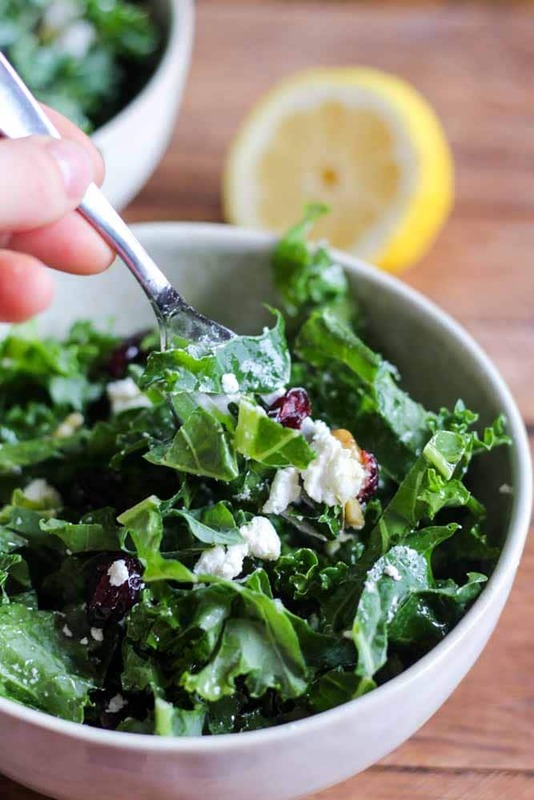 My second favorite part of this kale salad is the goat cheese. Because goat cheese. And the third is the dressing! It’s a homemade viniagrette made with olive oil, lemon juice and apple cider vinegar. Plus some salt and pep and honey. Sweet and tangy!! To make the dressing, add all of the ingredients to a medium bowl and whisk together until combined. Set aside. 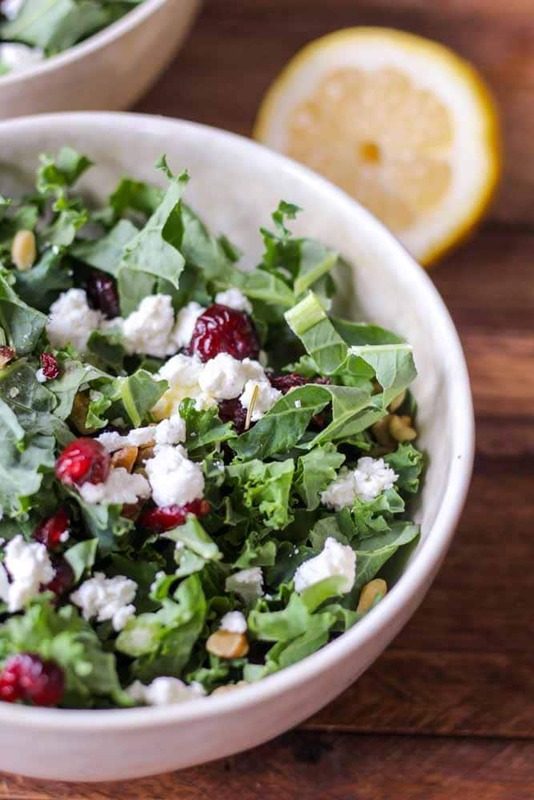 To make the salad, toss kale with goat cheese, craisins and nuts until mixed well. Pour dressing over top and toss agin. Serve immediately.